ProEnc’s outdoor projector enclosures have been selected from a number of competitors due the build quality and cost effectiveness, read on to discover more and find their discount coupons. In January 2017 ProEnc had been selected to propose a solution for an outdoor projector enclosure to be used at a test hotel in Florida. The environment was rather hostile, with the hotel being near the beach, so a regular enclosure was not suitable. After a site visit a solution was offered for 25,000 ANSI Lumens projector and in March 2017, ProEnc received the order. ProEnc always offer their solutions so the product works right out the box, no having to pay for upgrading to include a heater, ProEnc’s standard solution includes a heater. In the beach front hotel solution, they offered a stainless steel projector enclosure complete with thermostatic cooling and heating that also featured ProEnc’s compact air conditioning unit as the internal temperature of the enclosure would be high. The project housing was secured to an outdoor stand with ProEnc’s patent pending anti-theft solution that mounts the enclosure to the stand and is used in high risk areas thought impossible previously. The large viewing window had a built in wiper, so any sea mist or rain could be wiped off automatically and not affect the visual presentation from the projector. 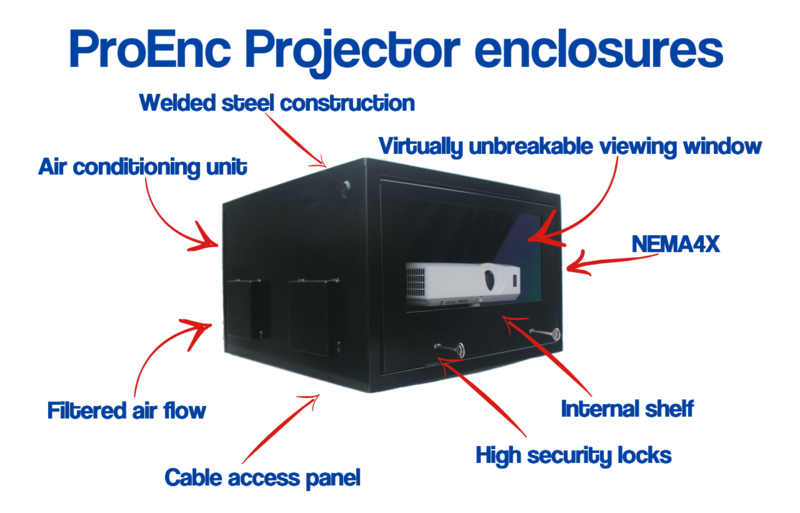 Result of ProEnc’s stainless steel projector enclosure solution. After the enclosure was installed and tested for 2 months in varying weather conditions, the hotel group gave ProEnc the order for a further 32 hotels on the East Coast of America. The project is set to be completed late September. A world renowned theme park with a character of a Mouse in Florida contacted ProEnc for an urgent replacement projector enclosure for one of their attractions. The criterial was that the enclosure had to be a custom unit a set size to fit into a pre-existing mounting structure. The real challenge was the client only had 14 days for the down time. ProEnc was the only projector enclosure manufacturer to step up to the plate. ProEnc got the order and manufactured the custom enclosure including powder coating in 7 working days and the enclosure was delivered to the client on the 13th working day, just in time! ProEnc have a limited stock of outdoor projector enclosures, which can be dispatched within 2 working days, depending on couriers. The range of housings available, the range covers projectors from 10,000 to 20,000 ANSI Lumens. In the past 6 months ProEnc has sold on average 12 enclosures per month due to them being in stock.